I found Alice + Ames when I spotted my friend's daughter in the most adorable dress. I hunted down the shop online and became a massive fan. 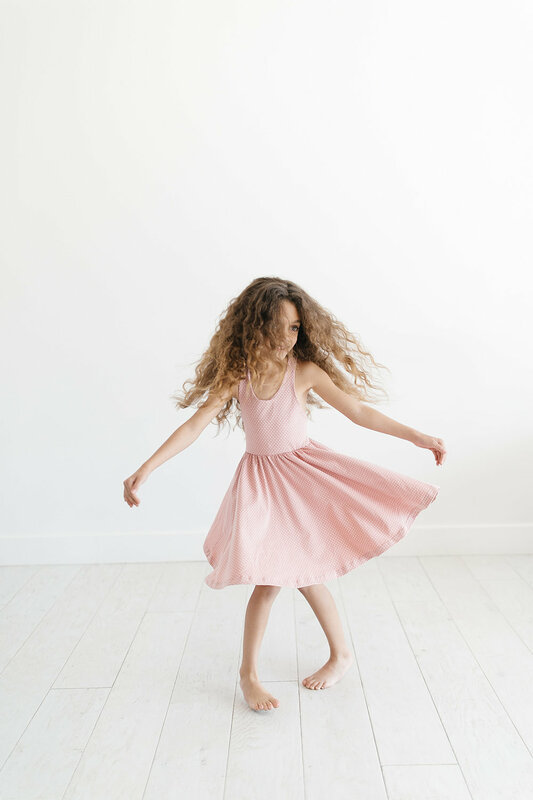 Stacie's leotards and dresses are perfect for little ones that want to wear "dress ups" when you aren't psyched on them eating out in full on Elsa regalia. Her dresses also get top marks for twirl height. If you have a dance loving kid, you know what I talking about. The brains behind Alice + Ames, Stacie Lang, is our new favorite gal...read on for more from this adventurous, driven mama. There’s me, my husband Geoffrey, and our 3 girls, Ivy, Lola, and Frances. I’m from sunny Arizona, born and raised! Ivy just turned 8, Lola James is 6, and baby Frankie is 3. I own a girls clothing brand called Alice + Ames, and this last April I launched a brand-new women’s line called Sunday. How did Alice + Ames come to be? Three years ago, I had just had my 3rd daughter. I was itching for a creative outlet since recently phasing out of our six-year-long side business as wedding photographers. Geoff and I knew we loved working together, and we always dreamt of different ways that we could work together full time. 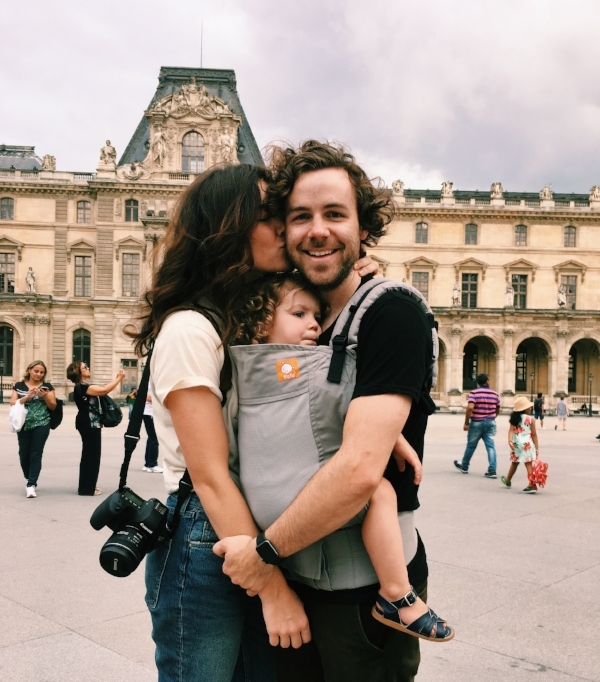 At the time, Geoff was at a consuming 9-5, and that grind really solidified the fact that we wanted a different lifestyle for our family—one with a more flexible schedule, one with more control over our own success, and mostly, one where we were able to spend as much time together as a family as possible. Having all girls and a love for clothing, a girl's clothing line just made sense! To me, it’s being kind, being brave, and being compassionate. Geoff and I became husband and wife when we were both 19 (!!!) and shortly after became parents at ages 21. In a way, it’s hard to ever remember a time when we weren’t Mom + Dad. While I don’t know if I’d recommend all teenagers to get married and start having babies, it’s been so fun growing up together—and I would do it a million times over again. We love to travel, but when we’re home—we’re homebodies! We love to cook and bake, but also love going out to eat. We love movie nights in, having friends over, and spending every minute outside during the beautiful Arizona winters. I’m actually embarrassed to admit this, but I’m not much of a reader! I probably listen to 2-3 business-related podcasts a week though, my current favorite is How I Built This with Guy Raz. It changes so much every day, and I love it! Some days I’ll be stuck on my computer answering emails and creating PO’s in my sweats, some days I’ll be shooting a new line at the studio, and some days I’ll be down at the warehouse counting inventory with Geoff. It’s fast paced and it’s unpredictable, and I’ll forever be grateful for how many (random!) things I’ve been able to learn on-the-go so far from this job (even if sometimes it was “the hard way”.) It keeps me on my toes! How do you maintain balance with work, a partner, kids, and yourself? Any tricks? Balance!? Ha! ;) Working from home with your spouse as your co-worker (and your kids in the same room most the time) can have its challenges to say the least. I like to think we’re getting better at creating balance in our home every day, but it’s a learning process for sure! We just signed a lease on our first office, and we’re really hoping that the designated work space helps create more of a boundary between work and home life (fingers crossed!). It can be really hard to ‘unplug’ from work if it’s in your home or accessible from your phone, but some helpful tips I’ve loved are; charging your phone in a different room at night, not checking emails first thing in the morning, and scheduling clear work hours throughout the day or week. As for our kids, we’re really into 1-on-1 ‘kid dates’ or trips. We spend so much time together as a family, that our girls really light up when they get to spend alone time with us. As for Geoff and I, we’ve found setting non-work time for us is crucial—even if that means a movie in our backyard once the girls fall asleep or a quick lunch date after a work event. Lastly, one thing we prioritize as a family is travel. Between the heat and the break from school, we plan as many trips as possible and hit the road during the summer! It may just be to California for a beach trip, or maybe it’s to Iceland, but either way, being all in essentially the same mini-van/AirBnB/plane row all summer brings us closer, removes distractions, confirms that we’re allowed to take a break from work even though we’re self-employed, and reminds us of what’s most important. I’m not necessarily the type to go out and get a massage or get pampered too much, but something I love doing is going on early morning walks by myself. I listen to music or a podcast and it’s been the best way for me to clear my head and curb any anxiety first thing in the morning. Also, naps! If I am ever given the chance to nap, I will take it and see you in an hour! Oh gosh, where to start!? I’d tell them to have fun with it, and if they’re not—I’d tell them to remind themselves why they started their business in the first place. When they fail, I’d remind them to have perspective, and to look back and see how far they’ve come. I’d remind them not to compare themselves to others, and I’d tell them to take time for themselves when they’re stressed. Lastly, I’d encourage them to delegate or outsource any responsibilities they can that they aren’t able to dedicate time for, or that aren’t bringing them joy.